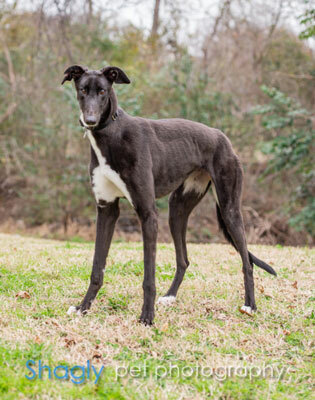 Georgia is an approximately 2 year old black female found as a stray in Oklahoma. She is being treated for open wounds and is doing well. Georgia has quite the vertical leap, and needs a home with an 8 foot fence. Georgia has not yet been tested with cats but is fine with small dogs. If there was one word to describe Georgia, it would be gentle! 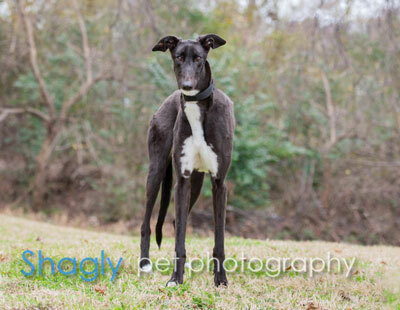 She is just the most delicate and gentle grey who wants nothing more than some humans to cuddle with. Georgia adores affection from humans, gives gentle kisses, and would love nothing more than to snuggle the day away. She's also a very big fan of stuffed toys and can entertain herself tossing them in the air and chasing them! Don't worry; she will share with you if you want to play too! Georgia has great leash manners and seldom pulls. She walks alongside other dogs quite nicely and only stops when she hears interesting noises. She doesn't mind if you touch her paws, belly, tail and seems to tolerate just about anything from her people. She's great on car rides! Georgia is young and extremely curious, wanting to go where you go and check out all the new sights and sounds and happily greets new people. She loves hugs! While not a big fan of the crate, she has learned to tolerate it for mealtime, bed time and should her humans need to leave the house for a little bit. She has been quite receptive to learning what's a dog toy and what is not. She rarely makes any noise, doesn't bark at the doorbell and just lets out the occasional whine which we have yet to decipher the meaning of. Georgia knows how to ring the bell to go outside to potty and hasn't had any accidents since her first few days in a house. She learned how to go up and down stairs quickly, doesn't beg at mealtime and is quickly getting the hang of "leave it". She has learned to stay off of the furniture although she would surely join you if you let her. She has lived harmoniously with a 9 lb small furry dog and wants to play with her very much. It took a little bit of time to get used the larger male dog in the house, but now has learned that he is a friend. She is great around our older child and I suspect she would be great with all kids given how tolerant she is to all kinds of affection. She will even let you dress her up in silly sweaters! When you meet Georgia, she will just melt your heart. Her fur is the softest in town, and you'll love coming home to her big brown eyes and wagging tail.